Acoustic and structure-acoustic analysis is of great importance are found in a number of applications. Common applications for acoustic and structure-acoustic analysis are the passenger compartments in automobiles and aircraft. The increased use of light-weight materials in these vehicles usually makes it even more complicated to achieve good passenger comfort in terms of low level of interior noise. When the weight of the structure is reduced, the vibrations could be increased and that could lead to higher noise levels. Another application where structure acoustic analysis is of interest is in light-weight constructions of buildings, to mention but a few. This paper describes the basic finite element formulations of coupled fluid-structure systems and an overview of the various formulations possible. Then a scheme for treating unsymmetrical coupled systems is outlined. The discretization is performed using displacement formulation in the structure and either pressure or displacement potential in the fluid. Based on the eigenvalues of each subdomain some simple steps give a standard eigenvalue problem. It might also be concluded that the unsymmetrical matrices have real eigenvalues. 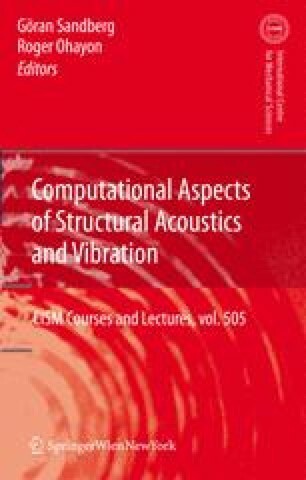 The strategies for formulating the structure-acoustic systems are illustrated using the educational software routines and elements.